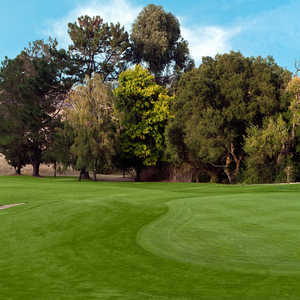 HERCULES, Calif. - Franklin Canyon is an 18-hole bentgrass course designed by Robert Muir Graves and built in 1968. The course fits remarkably evenly among the dips and twists, hollows and dry gulches throughout Franklin Canyon. Located in booming western Contra Costa County, it's a very popular place at 6:30 a.m. on a foggy Tuesday morning. Paul Kujawa and Doug Hansen are the staff pros with 31 and 15 years in the PGA, respectively. James Wallace is the general manager. From the tips Franklin Canyon is 6,761 yards. Rating is 71.8 and slope is 127. The 1st hole is a 532 yard, par 5 with a gradual left turn towards the green combined with a right to left slope. 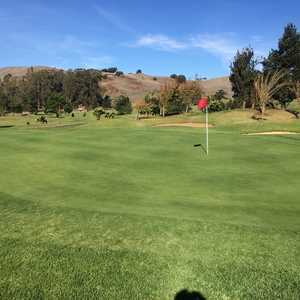 There are pines to the left and giant eucalyptus trees to the far right making this 1st hole typical of the roominess eventually apparent on most of the five par 5s. On a couple of the par 5s, the tee is a very narrow spot in the road. Morning fog is low on this early fall day giving some special looks to this well-kept course. One special look is the invisibility of the flag until you're within fifty or so yards. The 2nd hole is a 192 yard par 3 saddleback with the tee on one hill and the green up from that on another hill. If you drop it in between it's a goner. This is the first real canyon play and it's as daunting as playing over water. The fog is deceptive, making everything look closer than it really is. Dogpatch in the mist. The signature 7th hole is a 528 yard par 5 dogleg left. 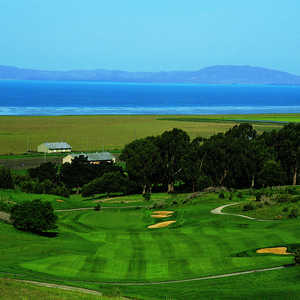 It slopes down to the left away from the fairway and towards some giant eucalyptus trees. Directly in front of the pin overlooking the green is an old black oak tree. What's tricky here, aside from the rolling green itself, is getting past the oak tree with the uphill side of the fairway being the only open avenue. Start right, go right, stay right. The course fits remarkably evenly among the dips and twists, hollows and dry gulches throughout Franklin Canyon. The 9th hole, a 519 yard par 5, literally gives a new twist to the use of dry gulches. This one, filled with California buckeye, live oak, digger pine and laurel, meanders in from the right crowding your vision as you get set to tee off. Then the gulch heads right out towards the hole for about 75 yards before it cuts sharply back to the right again. I hit the ball straight and well on this hole and it still dove into the forested canyon. The fog has burned off and once again it is suddenly a beautiful Northern California day. I notice in the shade of an ancient live oak that the grass is covered in dew shining like emeralds where the sun filters through. Alas, I hope for the luck of the Irish, but to no avail. The 10th hole, a 396 yard par 4, is typical of many holes on the back nine as it has a very narrow tee. Maybe not more than a few yards across at the blues, it will open up at around fifty yards. A hill comes sharply down on the left. And a lengthy pond runs along on the right. The 11th hole, a 242 yard par 3, is very memorable. It's almost a tunnel with trees and hills conspiring to bracket and interfere with any shot. The narrow green is surrounded by bunkers making this a very difficult par. Sometimes if I can find something about 20 feet out from the tee to aim over, I have a better chance of hitting the ball where I want to...sort of like a front site. This time I lined up over the third late blooming mountain buttercup on the right. And I was happy to see my ball clear the surrounding trouble on this hole. However, one mis-stroke and your ball joins thousands of others which fill a large 50 gallon wooden barrel in the corner of the pro shop. It's small consolation that if you can find it in the barrel, you can buy it back for a buck. The 14th, 15th, & 16th are all par 4s ranging from 373 yards to 457 yards. What's notable about them is the narrow tees, the hit over the gully and the rolling greens. By the time you get to the 16th, you've had enough practice to get a birdie. The 18th hole,is the longest par 5 at 535 yards. What with a final dry gulch cornering into the fairway from the left, this hole needs a straight shot off the tee. The middle of the fairway is high, wide, and handsome. But the green breaks sharply away from the pin, so your chip shot could roll forever. I speak from experience. Fortunately, Robert Muir Graves applied some of his signature designs to his work on Franklin Canyon. Such characteristics as "high activity with lots of movement in the land and golf contours" (intelligently using all of those slopes and gullies, I guess), in combination with bunkers and putting surfaces which are snaky and wavy. (Sounds sneaky, especially when you're trying to figure the break.) Perhaps Mr. Graves' most famous course is in Sea Ranch, Calif.
Franklin Canyon is a delightful challenge. It is also the choice of many walking golfers.